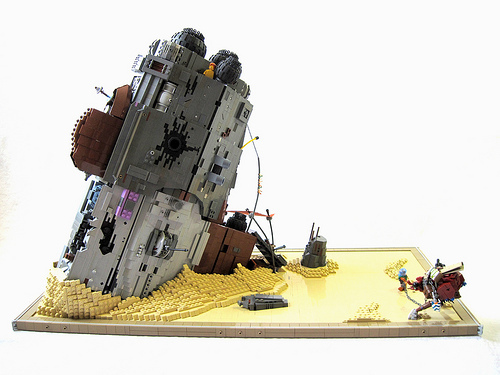 This diorama of a crashed space ship is rather striking. I love the post-apocalyptic feel. According the builder (Master Beef (with fries)), it is set in the Star Wars universe. But that neither detracts nor adds to this build as it really is able to stand on its own. There is just enough details of the ship to give you a sense of what the entire craft may have looked like, while the drifts of sand really add a sense of time…how long the wreck has been there. The makeshift shelter is also a very nice touch.